Jessica Arnold: Writing is absolute power. If you end a story with “and then they all got hit by a bus,” that’s exactly what happens. Life may be complicated and restrictive, but when you write up a new world, you set your own rules. You can truly let your imagination run wild. JA: It’s often hard to find the discipline to sit down and make things work. Once you’ve let yourself go crazy creating a story, you need to make sure all the puzzle pieces you just dumped out of your brain actually fit together. And that takes a lot of concentration, creativity, and persistence. But it’s that attention to detail that polishes up a raw story and really makes it shine. JA: A blank check. You can do anything you want with it. JA: Weeping Willows! I’ve always thought they were the elegant long-haired ladies of the tree world. JA: Sometimes I like to pretend I was a wild sixteen-year-old just chomping at the bit to break free and forge my own way in the world. This is not true. As a teen, I was a slightly less boring version of my current self. (You know that kid who never had a curfew because they never stayed out late? I was that kid.) I loved to read (still true). I was obsessed with fairytales (also still true). I had friends (thankfully also still true). I was the teen that all the adults looked at and said “she has her head screwed on straight.” But I was also very afraid of what life would hold for me. I’m glad to have a little more perspective on things now (and you have to imagine me saying this very serenely as I take a leisurely sip of tea … pinky raised, naturally). JA: Don’t rush. You don’t have to prove anything. I wrote my first book at seventeen and was in such a hurry to become this grand successful author that I forgot to enjoy the process. Now, several years of trial and a lot of error later, I have realized that grand successful authors are the lottery winners of the publishing world. The joy you will get from spending the time to write something honest and heartfelt is even more rewarding than seeing your name on a book cover or a bestseller list. It’s the writing that is important. Whatever follows it will follow in time. And maybe you’ll win the lottery. Who knows? JA: Before I die I would like to 1) give a truly amazing gift to someone who isn’t expecting it, 2) fall deeply, head-over-heels in love with someone (yes, I’m still waiting for this to happen … heavy sigh), and 3) write something that even I can be totally happy with. Number 3 is unlikely, because like most of my writer friendsown most merciless critic. Jessica Arnold writes novels for young adults. 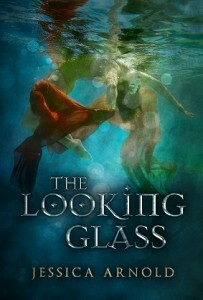 Her debut title, The Looking Glass, will be available from Month9Books in early January 2014. Visit her online home at www.iamjessicaarnold.com. The Looking Glass (Month9Books, 7 January 2014) is a loose retelling of Alice in Wonderland. After an accident leaves her body in a coma, a girl wakes to find herself trapped and alone in a haunted hotel. While miles away her heart pounds out its numbered beats, she must figure out a way to break the curse that has imprisoned her before she becomes its next victim. This entry was written by Lesley Fairy and posted on July 16, 2013 at 7:00 am and filed under Interview. Bookmark the permalink. Follow any comments here with the RSS feed for this post.